This is a collection of various documents and programs for the Psion Organiser series II, and its predecessor the Series 1. Some of these were originally written for and available on the Psion Organiser II Homepage. To check for recent updates, see the Change Log page. If you have comments, have interesting Psion II items not featured here, or if you want to buy an Organiser or some datapaks, you can contact me (Jaap Scherphuis) at psion a t jaapsch d o t net. Most of these packs can be downloaded from the Software Pack Images page, and then burned onto a pack using the Organiser Developer kit, available from the Software by others page. Games and other programs that I wrote for the Psion Organiser II. Software for the Psion Organiser II written by others. Image files of the various software packs that were available for the Psion. ROM image files of the Psions in my collection and a few others. Image files of the ROM of top slot devices such as the Comms Link. Emulates almost any model of Psion II, with packs and snapshot functionality. Allows you to create or edit OPK files, which can be used with the Jape emulator or copied onto a real pack. Tools for cracking the simple password system used on the Psion II LZ/LZ64. A simple tool for creating user-defined graphics for use in a Psion II program. Psion's own reference manual for the Psion Organiser Series II, CM and XP models. Addition to the reference manual for the Psion Organiser Series II, LZ/LZ64 models. Technical Reference Manual supplement about the Flashpak. Comms Link Machine Code Interface documentation. Direct control of the RS232 port from machine code. Technical information about the Top Slot, useful for controlling custom hardware. Exploded diagrams of the organiser with all the parts listed, as well as a parts price list. Various facts about OPL programming that are not usually found in the manuals. How to connect the Organiser via a Comms Link to a modern computer. How to find out the model and ROM version of the Organiser and its devices. Descriptions of the formats of the files on the Psion packs, and of Psion files transfered to the PC. In depth explanation of the Psion LZ password system, and its weaknesses. See also the Psion LZ Password Cracker. Description of the data that is transferred over a comms link between a Psion and a PC. My notes on the Psion Printer, including some technical details not in the manual. How to fix a common fault in the Psion Printer II. Description of byte code that procedures are translated into. 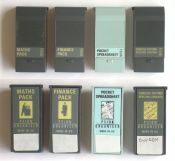 Datasheets for the chips used in the Psion and its packs, as well as various schematic diagrams. An explanation of number systems including binary, hexadecimal and binary coded decimal. Five part tutorial explaining in great depth how to program the Psion Organiser II using machine code. An explanation of flags and how they are used in arithmetic. Also a brief run-down of all other machine code instructions. Shows places where machine code can be stored, and how to do so. With their opcodes, effects on flags, and very brief descriptions. This table also shows the character sets of the Psion. A nearly complete list of the sytem variables on all Psion II models. List of all services provided by the ROM of the Psion Organiser II. A list of books for the Psion Organiser II, some of which can be downloaded. Lists of all hardware, software, and companies mentioned in Psion News and the User Catalogues. This was Psion's promotional magazine. This was Psion's promotional magazine that was issued about three times a year. Psion News Issue 1, Summer 1987 (7.5 MB pdf), with introductory letter. Psion News Issue 8, September-December 1989 (13.5 MB pdf), with Pager offer. Psion News Issue 10, April-September 1990 (16.3 MB pdf), with News supplement, Thesaurus offer and MC update. Psion News Issue 11, October-December 1990 (13.7 MB pdf), with MC200 promo. Psion News Issue 12, Autumn 1991 (14.6 MB pdf), with News supplement. Psion News Issue 13, Summer 1992 (16.7 MB pdf), with Psion 3 promo. This was the monthly news letter of the Independent Psion Organiser User Group. This was a quarterly news letter for the users of Flightmaster software. This was a quarterly news letter for the users of Flightmaster software. This software came on two 128K datapacks, and pack images are available on the Software Pack Images page. Images of the various software packs that were available for the Series 1. Description the format of the datapak storage as used by the Series 1. A list of the sytem variables of the Psion Series 1. Patent for the series 1 Psion Organiser from 1984. Lapsed in 2004. The UK Registered designs 1019736 and 1019737 are of figures 2 and 4 of the patent, depicting the Organiser and the Datapak, respectively. Video: Sketch from A Bit of Fry & Laurie (Series 2, Episode 2). This is a very rare appearance of the Psion Organiser Series 1 on television. © Copyright 2013-2018, Jaap Scherphuis. This is a non-commercial site, for educational use only, with the aim to be an archive of Psion Organiser II information and software that might otherwise be abandoned and lost. No copyright infringement is intended. If you are the copyright holder of anything reproduced on this site, and object to its presence here, please contact me (Jaap Scherphuis) at psion a t jaapsch d o t net.